Elkin Mathews and John Lane issued a prospectus for the new 'edition' of Oscar Wilde's Poems in 1892, probably around April, as it stated that the book would appear on 23 April. There was some delay, and the book was said to be 'just ready' on 7 May 1892. Advertisements, as we have seen in an earlier blog, were probably considered too expensive, and unnecessary. From the few advertisements and list of published books we have deducted that the book probably appeared in early May, and was sold out before the end of Summer 1892. The prospectus may have done the job. Hundreds of copies must have been printed, but only a few have survived. The order form (on the reverse side) mentions the details that the advertisements also dealt with: the hand-made paper, the 'decorated title and end-pages', the name of the binding design ('The Seven Trees') that was 'in gold on iris' with, between brackets, the word 'cloth', and the name of the designer. Much has been made of this title for the design, and it must be said, that it was quite rare to see the name of the designer advertised at the time, let alone the title of the design. That was quite unusual. Designs for earthenware and pottery had names, such as 'Willow Tree'. Ricketts had attended classes at the City and Guilds art school that was 'set up to train students for the local industries like the manufacture of hand-painted china' (as Paul Delaney wrote). We have seen that Ricketts signed his early drawings when young artists like him didn't dare to do just that. And, moreover, most of the bookbindings and the borders for title pages that he designed after 1892 were to carry a title. Bookbinding was considered to be a decorative art. Nicholas Franklin (in Oscar Wilde's Decorated Books, 2000) pointed out that the title suggested that the author held another view and considered the binding design to be an expressive, or representational art work, worthy of a title. However, we can't be sure whose idea it was to give the design its title. Not Wilde, I presume. The artist and the publisher held the same view on art. Earlier binding designs by Ricketts, commissioned by Osgood McIlvaine & Co., didn't carry titles. In advertisements, the cover for Oscar Wilde's Intentions was described as 'Cloth Extra', meaning that it had been decorated. The same goes for Thomas Hardy's A Group of Noble Dames. Wilde's Lord Arthur Savile’s Crime and Other Stories was said to have 'ornamental' boards. Other designs for Osgood, McIlvaine and Co., including A House of Pomegranates were only described as colourful: 'cover in moss-green and ivory white'. But Elkin Mathews and John Lane took publicity very seriously, and named Ricketts's designs, starting with Wilde's Poems. J.A. Symonds's In the Key of Blue and Other Essays had a cover that was called 'Blue-bells and Laurel'. The cover for Silverpoints was called 'Water and Willow Leaves'. Lord De Tabley's Poems, Dramatic and Lyrical had a cover of 'Rose petals'. 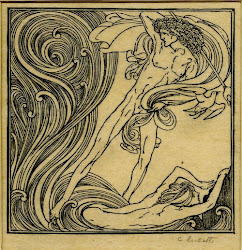 Even the cover design for Ricketts's and Shannon's pre-Vale edition Hero and Leander had a titled cover design: 'Pearl and Thread'. The book was sold exclusively by Mathews and Lane. Remarkably, designs by other artists were not given special titles, not even the designs by Charles Shannon for Wilde's Lady Windermere's Fan and A Woman of No Importance. This must imply that Ricketts and the publisher considered his designs as works of art, but not all book binding designs. For example, Selwyn Image designed the cover for Michael Field's Stephania, but it wasn't given a title. Perhaps, Image didn't want it, perhaps the publisher didn't even consider it. Ricketts certainly wanted his designs to be recognised as works of art. There seems to be a continuous line if we turn to the border designs for his Vale Press books that started to appear in 1896. In his bibliography of the press, Ricketts mentioned the titles of the border, such as 'Honeysuckle border', 'Laurel border', and 'Violet border'. However, he never used these titles in the prospectuses.